And of all yogis, he who always abides in Me with great faith, worshiping Me in transcendental loving service, is most intimately united with Me in yoga and is the highest of all. "Anyone who does not render service and neglects his duty unto the primeval Lord, who is the source of all living entities, will certainly fall down from his constitutional position." In this verse also the word bhajanti is used. Therefore, bhajanti is applicable to the Supreme Lord only, whereas the word "worship" can be applied to demigods or to any other common living entity. The word avajananti, used in this verse of Srimad-Bhagavatam, is also found in the Bhagavad-gita: avajananti mam mudhah: "Only the fools and rascals deride the Supreme Personality of Godhead Lord Krishna." Such fools take it upon themselves to write commentaries on the Bhagavad-gita without an attitude of service to the Lord. Consequently they cannot properly distinguish between the word bhajanti and the word "worship." The culmination of all kinds of yoga practices lies in bhakti-yoga. All other yogas are but means to come to the point of bhakti in bhakti-yoga. Yoga actually means bhakti-yoga; all other yogas are progressions toward the destination of bhakti-yoga. From the beginning of karma-yoga to the end of bhakti-yoga is a long way to self-realization. Karma-yoga, without fruitive results, is the beginning of this path. When karma-yoga increases in knowledge and renunciation, the stage is called jnana-yoga. When jnana-yoga increases in meditation on the Supersoul by different physical processes, and the mind is on Him, it is called astanga-yoga. And, when one surpasses the astanga-yoga and comes to the point of the Supreme Personality of Godhead Krishna, it is called bhakti yoga, the culmination. Factually, bhakti-yoga is the ultimate goal, but to analyze bhakti-yoga minutely one has to understand these other yogas. The yogi who is progressive is therefore on the true path of eternal good fortune. One who sticks to a particular point and does not make further progress is called by that particular name: karma-yogi, jnana-yogi or dhyana-yogi, raja-yogi, hatha-yogi, etc. If one is fortunate enough to come to the point of bhakti-yoga, it is to be understood that he has surpassed all the other yogas. Therefore, to become Krishna conscious is the highest stage of yoga, just as, when we speak of Himalayan, we refer to the world's highest mountains, of which the highest peak, Mount Everest, is considered to be the culmination. It is by great fortune that one comes to Krishna consciousness on the path of bhakti-yoga to become well situated according to the Vedic direction. The ideal yogi concentrates his attention on Krishna, who is called Syamasundara, who is as beautifully colored as a cloud, whose lotus-like face is as effulgent as the sun, whose dress is brilliant with jewels and whose body is flower garlanded. Illuminating all sides is His gorgeous luster, which is called the brahmajyoti. He incarnates in different forms such as Rama, Nrsimha, Varaha and Krishna, the Supreme Personality of Godhead, and He descends like a human being, as the son of mother Yasoda, and He is known as Krishna, Govinda and Vasudeva. 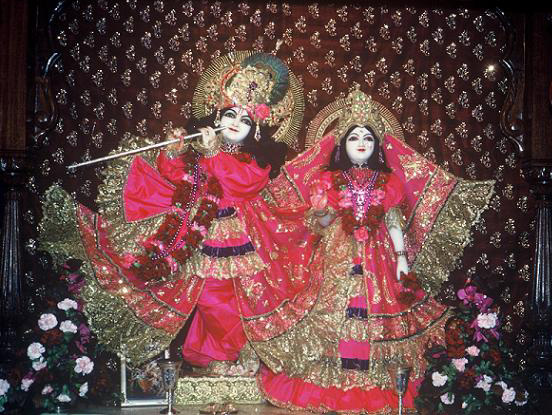 He is the perfect child, husband, friend and master, and He is full with all opulences and transcendental qualities. If one remains fully conscious of these features of the Lord, he is called the highest yogi. "Only unto those great souls who have implicit faith in both the Lord and the spiritual master are all the imports of Vedic knowledge automatically revealed." These are some of the means for performance of bhakti, or Krishna consciousness, the highest perfectional stage of the yoga system.